Get the card that saves you 15-50%* instantly! Reduced cost on dental care! With the Carefree Dental Card, you could be saving money on every single visit to the dentist. 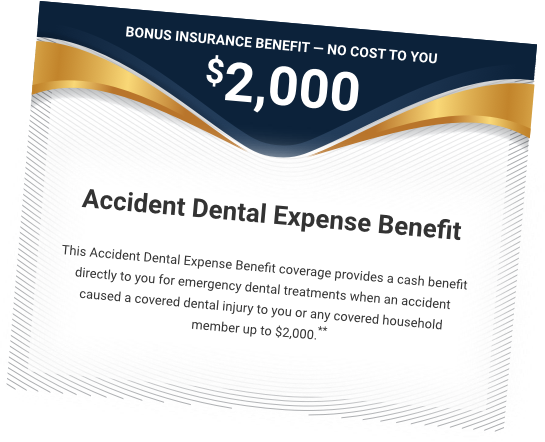 And when you consider that going to the dentist can easily cost $1,000 - $2,000 or more... the Carefree Dental Card is an amazing bargain – it starts at just $15.95/ mo. single and $19.95/ mo. for your entire household! "Instead of paying $324.00 for my son Mitchell's two surface fillings, I only paid $119.00! I am so pleased with Carefree Dental!" We’ve been a trusted provider of benefits to U.S. consumers for more than a half-century. 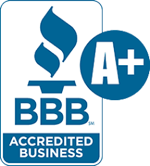 We are an A+ accredited organization by the Better Business Bureau. We currently service health benefits for over one million individuals nationwide. Families Save BIG for Just $4 a Month More! Looking for great care that won't break the bank? For just $19.95 a month, everyone in your household can use the same card — it's still just one low monthly rate. Just think: with just one card you could save on cleanings for everyone in the household... braces for all the kids... plus most dental procedures you need. "My grandson had a root canal and crown with this plan. I would have had to pay $1,300 originally-but with my Carefree card I only paid $500." Save 10–85% at over 65,000 participating pharmacies nationwide including CVS, Rite Aid, and Walmart. I went to Aspen Dental for an x-ray, extraction, and cleaning. Without the card, I would’ve paid $560, but I only paid $194. I am so pleased with my savings! I've had 19 extractions and dentures. Without Carefree Dental, I would've paid $194.00 per tooth, but with Carefree I only paid $90. I paid $5,268.00 in total for my extractions and dentures, compared to $7,624.00 that I would've paid without it! I used to get my high blood pressure medication from CVS Pharmacy and paid $60. With Carefree I only pay $24!